Six billion identical clones make up the entire population of Earth, and William 790-6 (57th Iteration) is exactly like everybody else. In his one year of life he will toil in suburban mediocrity and spend as much cash as possible in order to please his corporate masters. When 790's first birthday (and scheduled execution) finally rolls around, a freak accident spares his life. 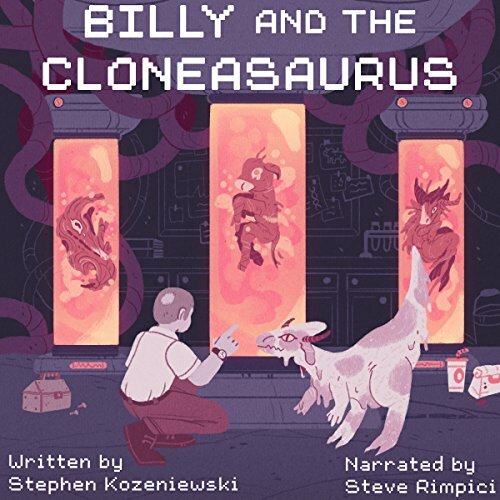 Dark, haunting, and blisteringly satirical, Billy and the Cloneasaurus is the story of one "man's" attempt to finally become an individual in a world of copies. What was one of the most memorable moments of Billy and the Cloneasaurus? Billy and the Clonesaurus tells the tale of William 790-6, a clone who lives in a town filled with other William clones, in a world filled with even more William clones. As with every other William clone, he is to be slurried, or decommissioned. When an accident happens at the slurrying plant with William 789 and 790 is given another day to live, he spends it with his replacement and starts to resent the idea of his imminent departure. William 790 (later known as Billy) is a good clone. He goes to work every day in his boring insurance sales job, has the same thing to eat every night, catches the ball game with the other clones, sleeps, and gets up and does it all over again. Each clone gets 1 year of life and then he gets slurried. It’s a world of monotony, Williams as far as you can see. Yet Billy manages to avoid getting slurried due to a freak accident. He then starts questioning his life and this entire existence. I initially tried to read the ebook but then switched over to the audiobook. The beginning reminded me of that movie Ground Hog Day. Billy does the same routine again and again, even after the freak accident because that’s what his replacement would have done. So it was a little slow for me as I kept waiting for something more to happen. When I switched over to the audiobook, things moved along more quickly for me. Billy has to get sneaky, something he isn’t programmed for. He learns about an odd building somewhere in the wilds in between two Williamsport cities. Yep. All the cities have ‘William’ in their name and everyone lives in the glorious country of Williamerica. Privately, this was all rather amusing to me since my husband is Bill. Ha! OK, so Billy starts showing some initiative and the story gets more interesting. He stops to pee by the road and he happens to see this weird building (a windmill) and as he goes to investigate he finally comes across the cloneasaurus! Yes! Since this little guy is on the cover and in the title I really wanted to meet it. This reptile understandably freaks Billy out, since all animal life has been extinct for several generations of Williams. From there, Billy meets the William that made the cloneasaurus and then we finally get our one and only female, Willa. The second half of the book was way more interesting than the first. Billy starts looking at the top of the hierarchy and how he can go on living. He’s also fascinated with Willa and some awkward conversations occur which are amusing to the reader but rather embarrassing for Billy. He’s never used his personal equipment for self gratification so he’s in the dark about natural procreation. The ending was down right creepy. I loved the ending. It really made the book for me. Things don’t go as Billy had hoped nor how I expected things to go. The Narration: Steve Rimpici was a really good fit for this book. He sounds just like a mild mannered boring accountant. He makes a really good William 790…. along with all the other Williams in this world. Honestly, it was probably a real challenge to come up with nuanced voices that all sound very similar and yet can remain distinct in a conversation. He did this with capturing each characters emotions. I found the conversations between multiple Williams easy to follow. He had a believable female voice for Willa. This was a fun book narrated nicely by Steve Rimpici.This world is full of clones named William,most go by Will.All will have the same cars, houses,etc..and a 1 year lifespan.What if a Will skips his day with the slurry machine?This is what happens.I was provided this book by the author, narrator or publisher. Lives up to the title and more! As a fan of the name, which comes from a Simpsons episode, this book was written really well and was so entertaining! This book rocked! I described it to a friend as being 1984 meets The Lego Movie! I didn’t really have any idea of what to expect. I hadn’t read the synopsis or any reviews of it. I just knew it was by an author I wanted to check out. What really sticks with me is the tone throughout the story is pretty level regardless of what’s happening, but that’s just a thin covering of the real tone of the story. The narration was perfect for me as well. Billy and the Cloneasaurus was right up my street and is a fantastic modern day dystopian that is gripping and memorable. Definitely worth checking out!